LadyBroadoak Visionary Planetary Healing Tutorial: My son's artwork - FUNDRAISING APPEAL BUY THIS ART !! My son's artwork - FUNDRAISING APPEAL BUY THIS ART !! 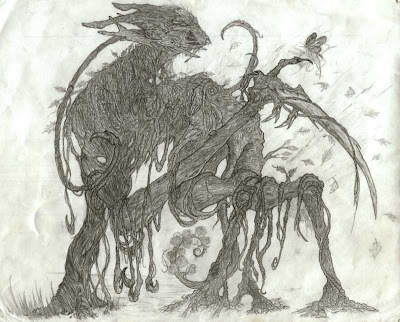 This is a rendition of a plant entity done with original ideas and concept from his own imagination. He comments "it represents a peaceful caretaker of all plant life and forests, the spiritual concessness trees, flowers, and grass. some points of note are it's affinity with insects such as the butterfly at its fingertip, the sychte to till the earth, and it's rosebush tail".